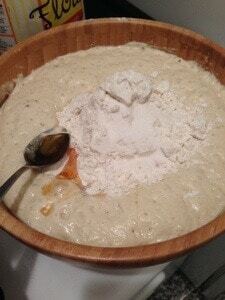 Begin by mixing the 4 cups of bread flour, 1 teaspoon of instant (rapid rise) yeast, and 2-1/2 cups of water in a 4 quart mixing bowl. It should have a thick consistency. Cover the bowl with plastic. 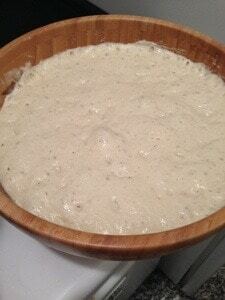 Let the yeast do its job and allow the mixture to double in size (at least two hours). Once the sponge has risen, mix 1 tablespoon of barley malt syrup, 2 tablespoons of honey, additional teaspoon yeast, 3 teaspoons salt, and about 3 1/2 cups of the bread flour into the sponge. 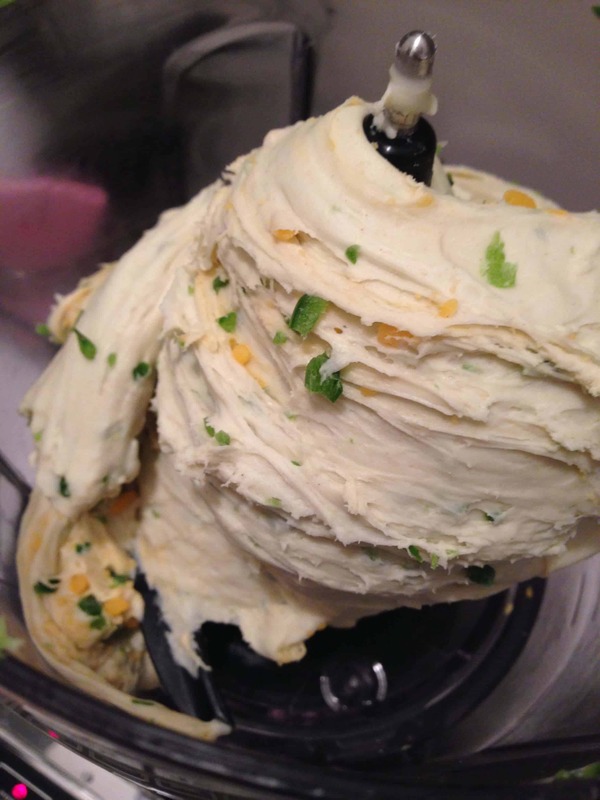 Once the ingredients are fully incorporated, added in the jalapenos and cheddar. 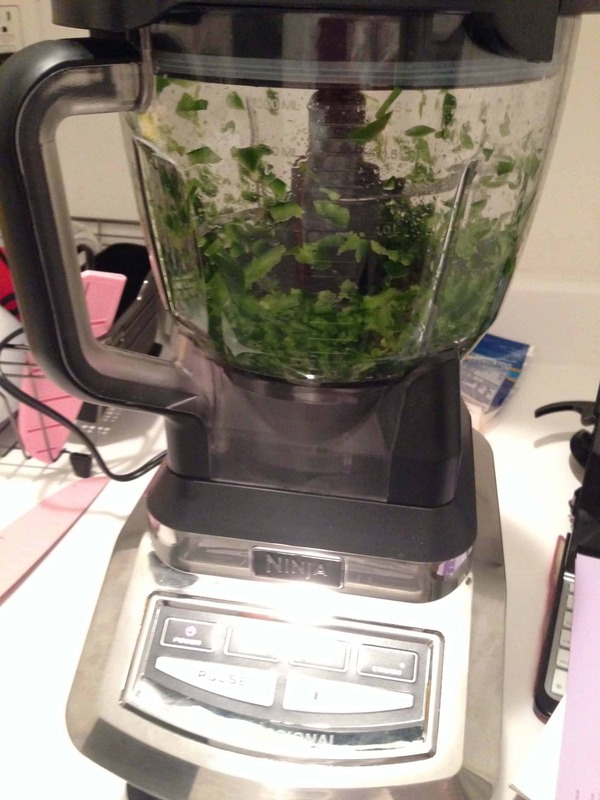 Note: I used a food processor to chop up the jalapenos, because my hands always react to the oil in jalapenos. If you do dice them by hand, be careful! 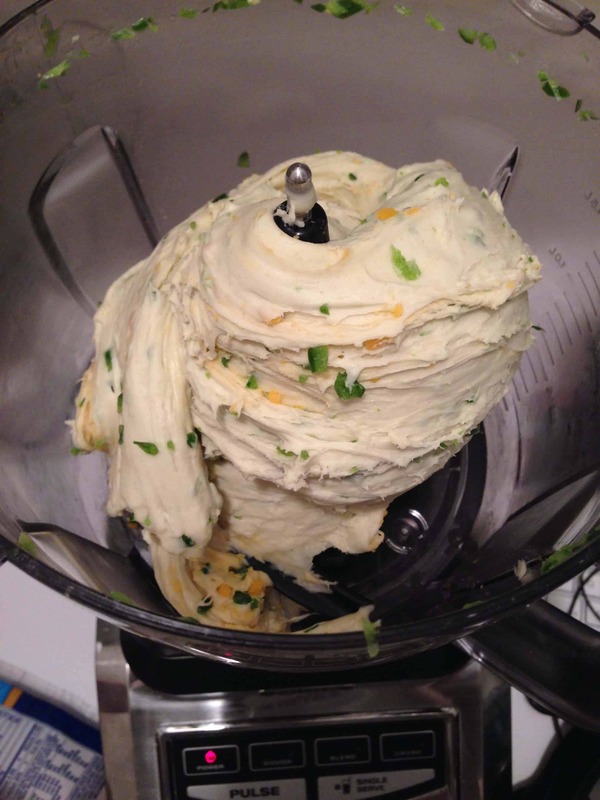 Once all of the ingredients have been mixed in, knead the dough either by hand or with a dough hook. Add the remaining flour as necessary, and knead until the dough is a little stiff (not tacky) and a little springy. It should be satiny and smooth, without any dry bits of flour. This takes about five minutes using a dough hook, or about 10 minutes if kneading by hand. 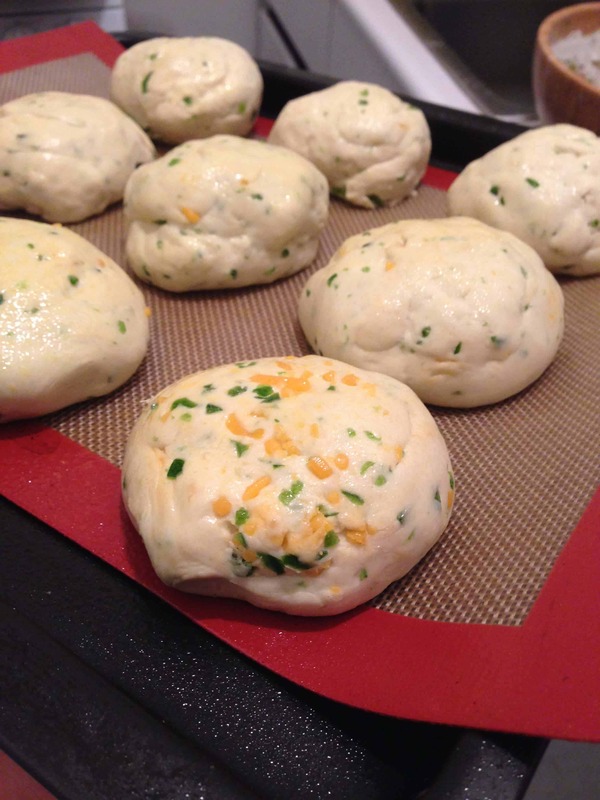 Divide the dough it into 14, equally sized pieces. 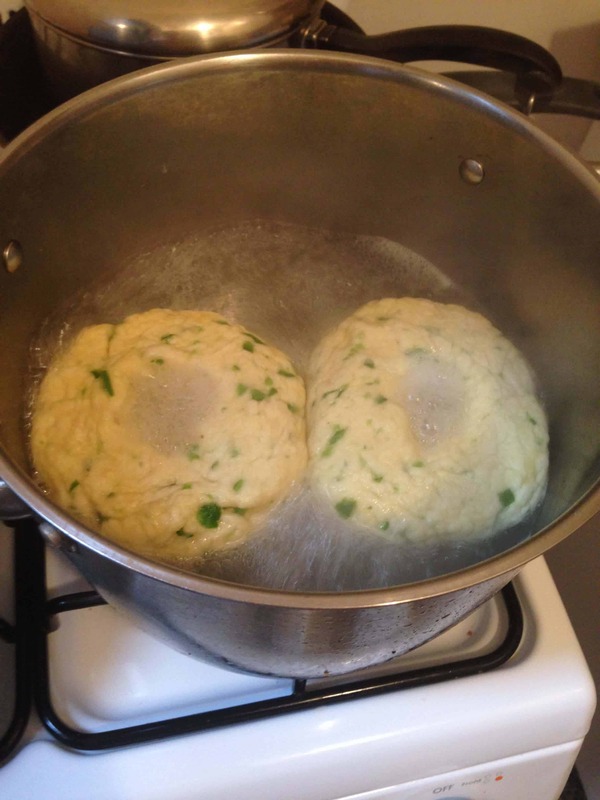 Shape each piece into a round smooth ball by using your thumbs to pull one surface of the dough around so that it forms a nice smooth skin, and squeeze the folds on the bottom together to seal this ball. Take it and roll it between both cupped palms to further smooth out the folds and form a nearly perfectly round ball. Places these on a greased cookie sheet, or silicone baking pad. 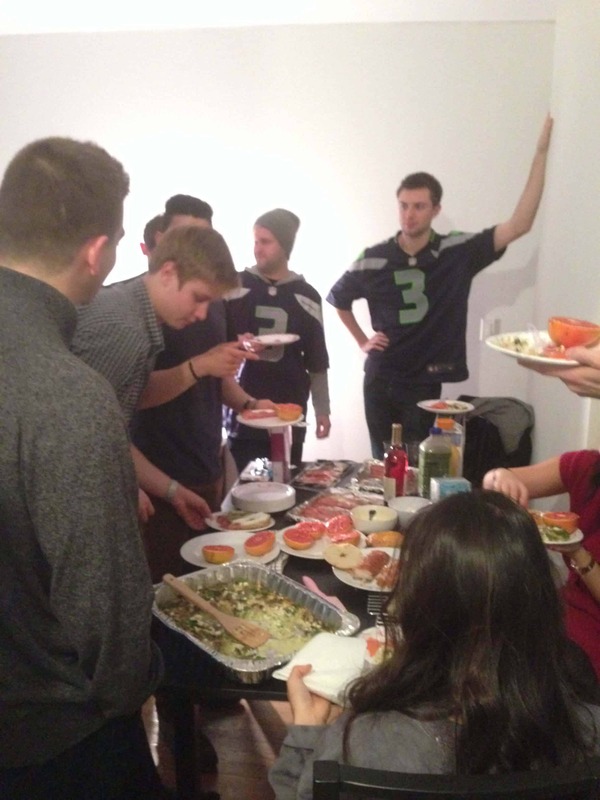 You should let them rest for about 10 – 20 minutes to allow the gluten strands to reform. 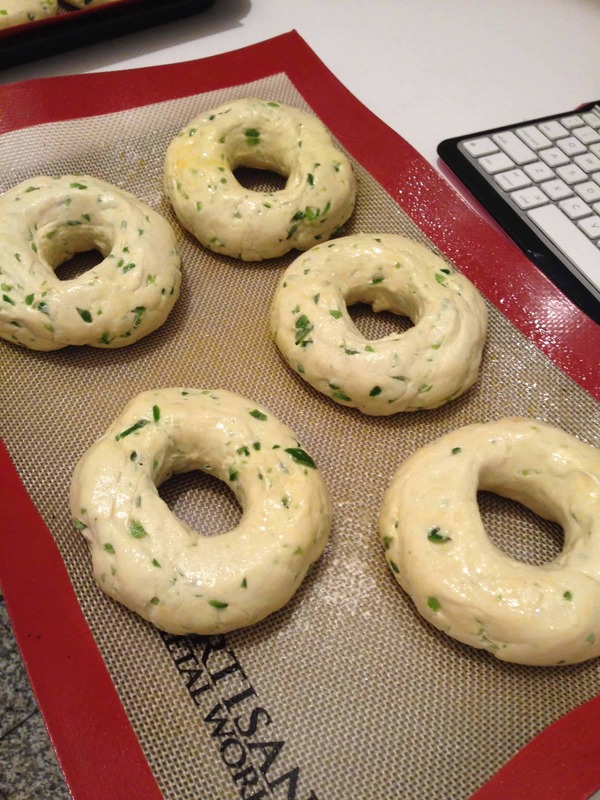 To shape the bagels, grab a ball of dough and push your thumb into the center. Poke with fingers of both hands, begin enlarging the hole. 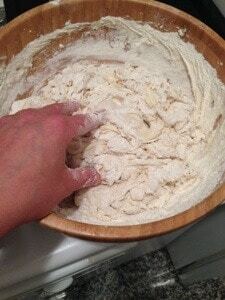 Work your hands around the circle so that the dough remains the same thickness around the hole. As the hole closes up, keep stretching it until it shrinks to no less than about 2? diameter when relaxed. 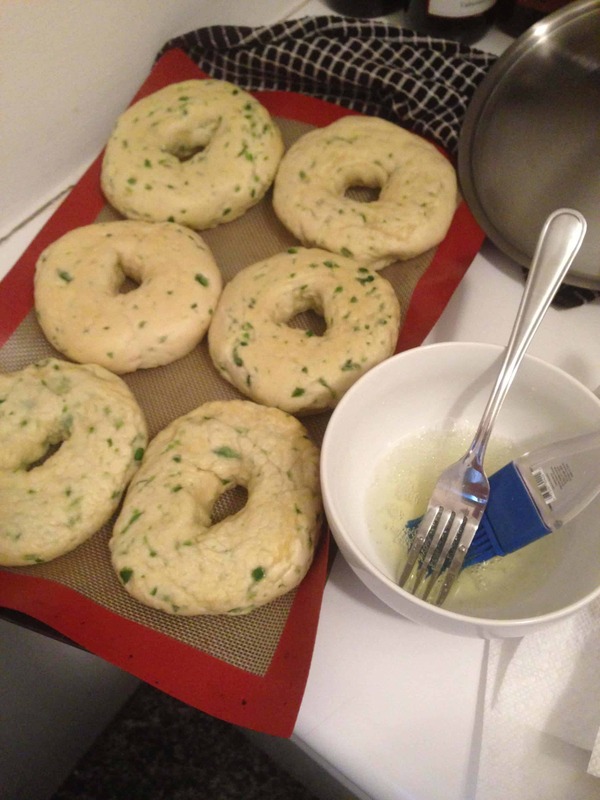 As each bagel is formed, place it back on the greased cookie sheet, or greased silicone baking mat. 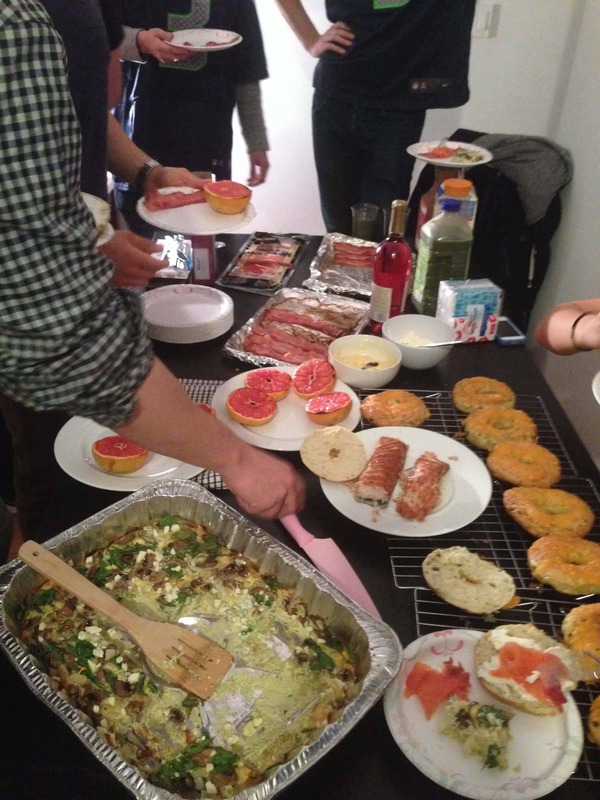 Make sure to leave enough room between bagels; 6 – 8 bagels will fit on a cookie sheet. 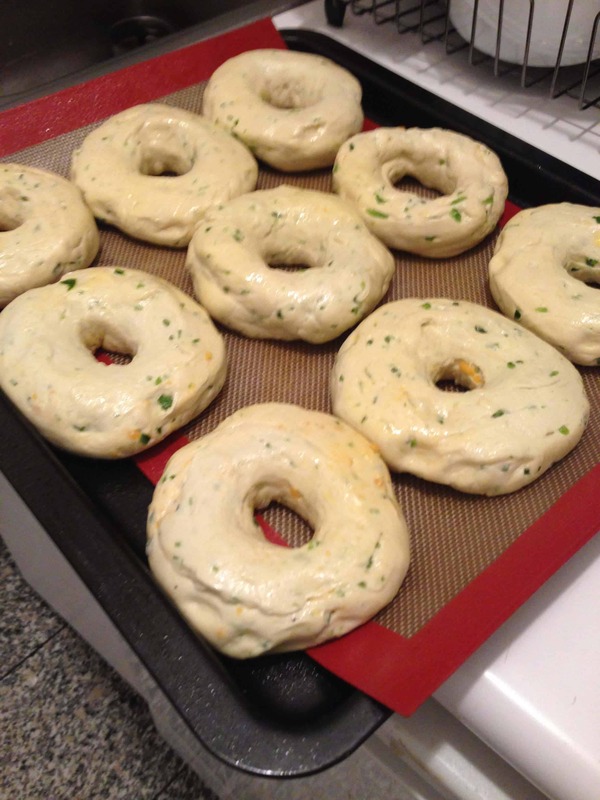 Once the bagels have been formed, let them rest for a few minutes to allow them to proof. As they begin to rise a bit, they are ready for the fridge. Spray the bagels with a light cooking oil spray and lay a sheet of plastic wrap over them.Place them in the refrigerator overnight. Chilling the dough allows the yeast to work on the proteins in the dough, which yields some of the classic flavors that make bagels taste like bagels. Place two baking racks in the center of the oven, and preheat to 450 degrees F. Fill a pot with water, and add one tablespoon of barley malt syrup, and one tablespoon baking soda. The makes the water a little bit more alkaline. Bring the water to a boil. Prepare a couple of baking sheets. Take the bagels out of the refrigerator. Carefully lift the bagels, and place them two at a time in the boiling water. Boil them for 45 seconds to a minute on one side, then flip them over and boil for an additional 45 seconds to one minute on the other side. The longer you boil them, the chewier the crust will become. Using a slotted spoon, place the boiled bagels on paper towels. 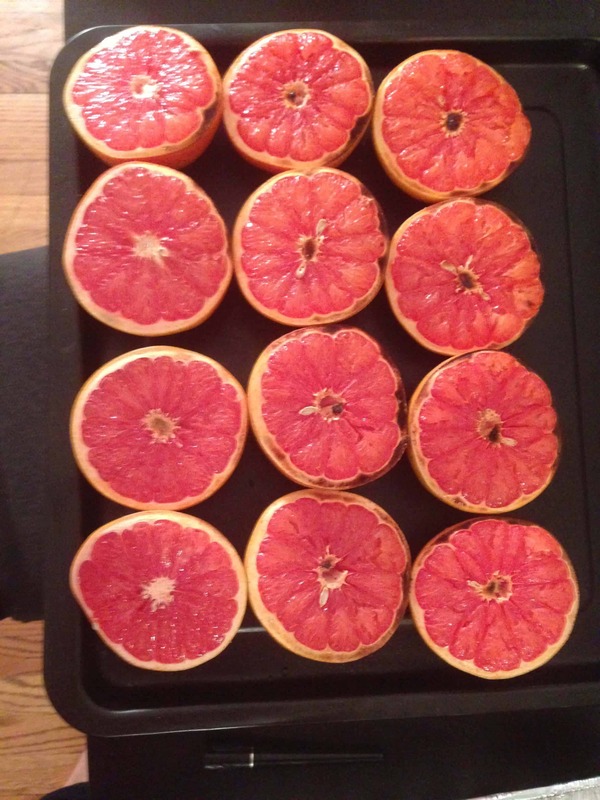 Pat them dry, then place them on the baking sheet. 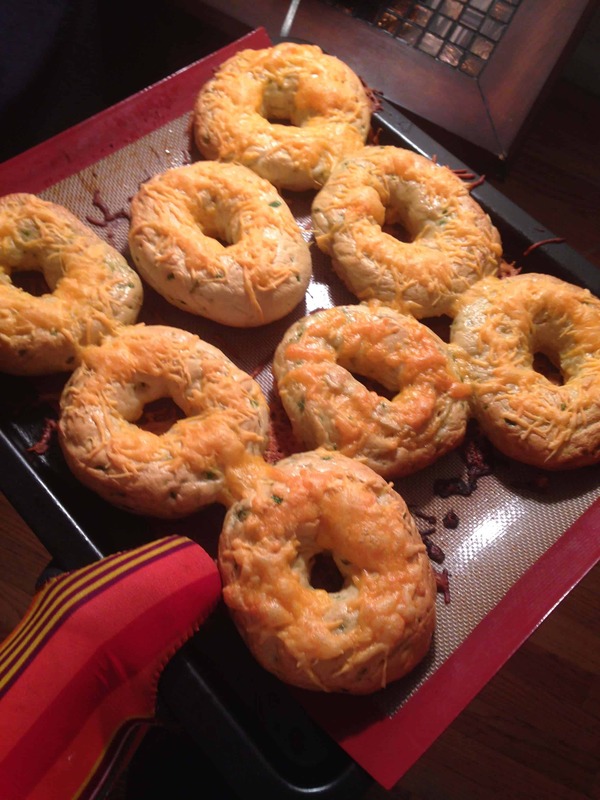 Brush the bagel tops with egg wash, then place the cookie sheets in the center of the oven and bake for five minutes. 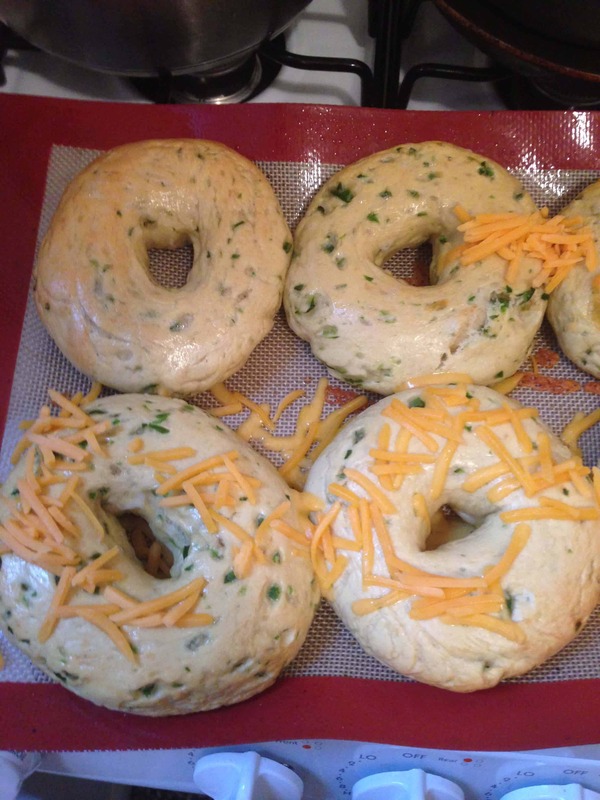 Take then bagels out at this point, and sprinkle the tops with the shredded cheddar. Let the bagels bake for another 7 to 10 minutes, until they’re golden brown. My review: I really liked the amount of jalapenos in the dough. 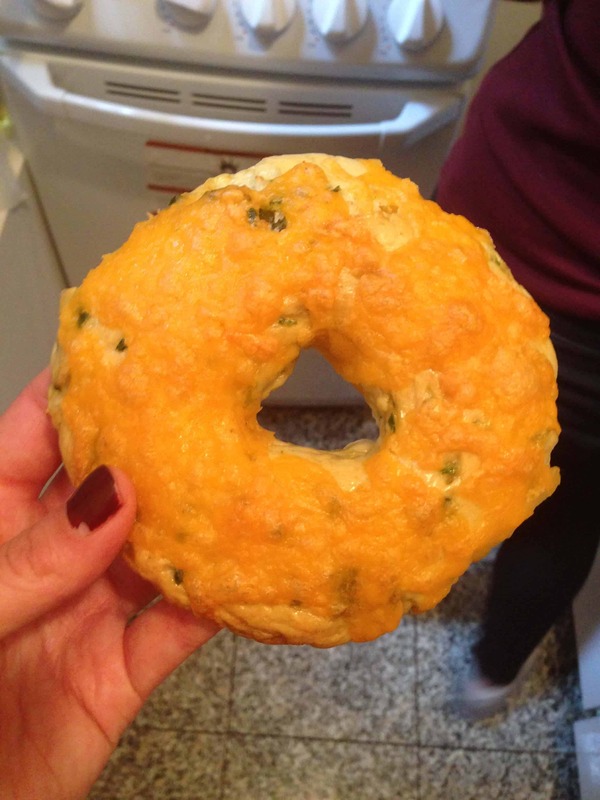 The cheddar helps balance the slight kick from the jalapenos, as does the cream cheese. 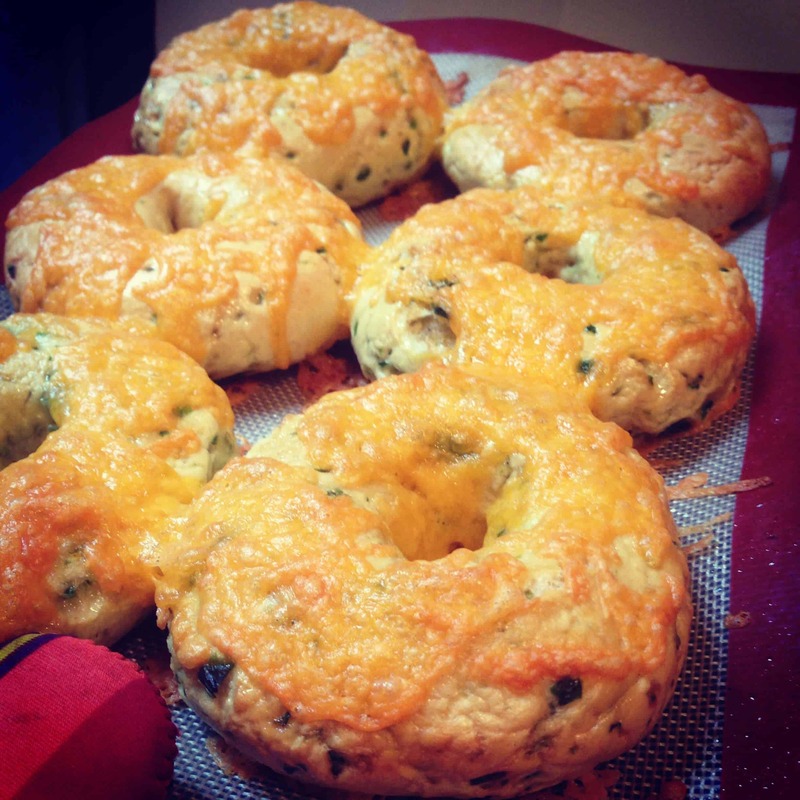 The bagels also had a great chew and crust, and I will definitely make these again.